Sixteen days ago my husband and I drove out to the Kamma Mountains of the Nevada desert. An entire year had passed since we had been there. Neither of us spoke as our wheels crunched over mile after mile of gravel road. Each was preoccupied with memories of our last trip to the Kamma Mountains when, during one day, we sighted 21 mustangs. Interspersed with those memories was apprehension about what we would–or would not–find when we arrived this time. Until a year and a half ago, I was among the U.S. population who had never seen a mustang in the wild. That changed in August of 2012 when one day my husband and I visited the remote Kamma Mountains’ Painted Canyon. The horizon that afternoon was the same shade of gray as the gravel road due to smoke from several wildfires commingling in the still air. We were lulled by the sky’s anomalous hue and full bellies after a picnic. We ascended a knoll and turned right opposite Rabbit Hole Spring. And there, after traveling thousands of miles in the Nevada desert over a span of four years, we watched the first mustang we had ever seen cross the road. That afternoon we would see a total of 17 mustangs, all of which appeared vigorous and healthy. Among them were a tall black stallion and his family. Because we had traveled many, many times before in the Kamma Mountains, and never seen mustangs there, I wondered whether these were survivors of the U.S. Bureau of Land Management round-up in the Jackson Mountains a couple of months prior. The U.S. Bureau of Land Management, field agency for the Department of the Interior, has been for the past several years conducting round-ups of mustangs across the western United States. There are currently more mustangs in captivity in the United States than there are living in the wild. Although the BLM contends that its data supports the need for removal of the mustangs on the basis of insufficient water and forage, frequently it permits cattle–for which it receives revenue from ranchers for supplementary grazing–on the same area of range that it claims will not support mustangs. In November of 2012 we returned to the Kamma Mountains and discovered even more mustangs than we had seen in summer. All appeared well fed and lively. A juvenile male which had apparently been ostracized by the herd, emerged from a canyon to fraternize with us when we stopped to eat lunch. He pranced around our Land Rover as if delighted to join us. Later that same day while crossing the Mountains on a higher pass, we found the black stallion we had seen in summer, with a few new mares and a foal. About four miles from there back down in the canyon, on the western end of the Kamma Mountains, at the edge of Black Rock Desert, we saw two mustangs grazing together and a third at a distance. They appeared contentedly sedentary and I considered that they might be older. Equidistant between the stallion and the west end horses, we came upon a new herd of cattle. I expressed to my husband concern that the BLM would consequently announce a need to remove the mustangs from the area. Back at home in California, I scanned the BLM Winnemucca website and round-up schedules throughout the late fall, all winter and into the spring of 2013. I saw no mention of the Kamma Mountains mustangs. Then, being preoccupied with projects my husband and I have taken on this year, I stopped looking. In early August of 2013, I was heartbroken to read on Laura Leigh’s Wild Horse Education website that the BLM had just completed a round-up of mustangs in the Blue Wing/Kamma Mountains complex, a term assigned by the U.S. government to a borderless region I would define as vast desert wilderness and a sacred experience of the American West. Laura Leigh is an American hero who has, to the exclusion of all else in her life, devoted the past several years to patiently and methodically documenting the relationship of the BLM to Nevada’s wild horses, and to challenging in courts the liberties the BLM routinely employs to justify mustang removals. One of the major legal challenges Leigh has posed to the BLM this year relates to First Amendment rights aimed at removing BLM restrictions on inspections of wild horse holding facilities to confirm the captive mustangs’ location, treatment and conditions. This is significant because investigations into BLM practices have produced evidence that wild horses are disappearing from BLM-contracted holding facilities and from ranches where hundreds of horses released to private parties through BLM-sanctioned adoptions are supposedly being held. It is widely speculated and proof is being assembled, that in both cases, the BLM has been complicit in the sale and transport of these wild horses across international borders for slaughter. I did an on-line search and found a video of the Blue Wing round-up posted on U-Tube by the American Wild Horse Preservation Campaign. Because of AWHPC’s efforts, I was able to witness portions of the event, to look for mustangs I might recognize (I didn’t see any but the footage is limited and the round-up targeted hundreds of horses from multiple bands) and to try to visualize how the round-up might affect any mustangs which could escape it. Internet media is playing a vital role in the events surrounding mustangs, as most of the BLM’s mustang-related activities take place in extremely remote areas and with very little notice to the public, making them difficult to monitor or follow. The Blue Wing/Kamma round-up was one of the few BLM gathers where public access was permitted. Laura Leigh’s WHE images and AWHPC’s video of the Blue Wing/Kamma round-up made the vast Nevada desert sanctuary that my husband and I know and love, appear small and terrible. More than half of the mustangs we saw during our 2012 travels through the Kamma Mountains were not visible on this trip. Among those did see, depression was palpable. The horses were sluggish. And skittish. The black stallion was gone, along with most of his family. Three of his mares remained with one foal, hunkered at the base of a mountain. The two mustangs pictured in these photographs might or might not be the same couple we saw at the west end of the range last year. A single young black and burnt umber stallion down the road from them, was the bleakest figure of all. His head slung low, he appeared to be trudging. There is a special sort of heartbreak that comes at the sight of a man-made tragedy. I pray every day for the comfort of these mustangs and the return of those in captivity to the range. In my faith, the lives of these and all mustangs have been made whole again. Thank for that contribution, a very appropriate quote. Conquistadors brought highly prized ancestors of these horses to the United States in the 1500’s. Mustang is the Spanish term for ownerless or stray horse. Thank you!!! I am so enjoying following your blog! The rounding up of horses and slaughter really bothers me. They are beautiful and for years were the mode of transportation. They deserve dignity, respect and protection. Thank you for sharing this information. My hope is that by sharing these personal experiences, people who don’t have an opportunity to witness the beauty of these iconic mustangs will be stirred to learn more about the trials of our wild horses. I think that with the range being so remote, it’s difficult for a lot of people, even animal lovers, to grasp exactly how damaging the BLM’s activities have become. Equally troubling is that there does not appear to be support in Washington for effecting a balance to the BLM’s activities, although it would be well within its legislative rights to do so. I think it’s all a crime..
Oh, this is heartbreaking. I remember seeing, from afar, a couple of mustangs in the foothills above Palm Springs. This was over 20 years ago. They were so majestic. What an amazing experience it must have been to see one come right up to your Land Rover. p.s. Very nice new blog design and, especially, copyright statement. Thanks for noticing, I appreciate the feedback! Thank you for sharing your memories and experiences with the Kamma Mountain mustangs. What you saw on your last visit shows the impact of human disturbance and fracturing of the family bands, it is indeed sad to witness. It is a privilege to witness these horses in the wild. I feel compelled to report on my experiences, in the hope that by raising awareness and introducing this bit of truth into the BLM’s vast, amorphous narrative, it will in some small way bring us closer to the pure and honorable resolution that these mustangs deserve. Please, help stop the round-ups ! Your blog post was an unexpected “link in the chain” of documenting the horses. If there is anything I can provide to you to “help” fill in any gaps you might have left about the removal let me know. I toured the area prior to the removal with BLM and documented the area. May God Bless those horses and burros…. I would love to work with you to try to further reconstruct and document the impact of the BLM round-up on the Kamma mustangs. My sincere thanks for your selfless devotion to the plight of these magnificent wild horses. What spectacular picture they make for! Gorgeous capture as always, dear Vivian! their color, lush mane… I could write a poem on them… its such a joy to see horses run wild & free. Killing such magnificent creatures would be such a sin, I mean any helpless creature for that matter, it truly breaks my heart to think about the many dangers these beautiful creatures should save themselves from. I shall have them in my prayers. Great post, fell in love with the captures! This is such a disturbing post Vivian. Why is the US government doing this? These are wild horses. You wouldn’t hear of lions and Cheetahs being rounded up and held in captivity in Africa to be ‘adopted’ or ‘slaughtered’. There would be an international outcry. It seems quite an absurd notion to do this to any wild animal. Haven’t we left those sorry episodes in our collective histories behind? Clearly not in the US. I do hope that Laura Leigh is successful in her campaign. This surely needs much great public awareness. Thanks for the post and the wonderful pictures of such majestic and ‘free’ wild animals. Best of luck to you all and more especially, the horses. Thank you for your interest and your insights, Chillbrook. I actually have been surprised for a number of years that there has not been an international outcry about this situation. To its credit, New Zealand’s horsetalk.co.nz was an early reporter on these events and, if I recall correctly, it was there that I initially learned about Laura Leigh. I had heard about the round-ups and was seeking information but at that time the story was largely suppressed in the U.S. media and had not yet caught the attention of the international media at large. I’ve illuminated Laura Leigh as a hero because to me she represents the best of humanity. She has given of herself selflessly to save these wild horses and she is literally playing the role of David against Goliath. Despite legislation in place to protect these mustangs, the BLM’s vigilante role devolved during the Bush administration when a rancher, Ken Salazar, was appointed head of the Department of the Interior. Even with Salazar now gone, Congress seems reticent to assume a corrective role. Historically speaking, while this isn’t the first time in this country or others that a government has sacrificed lives, welfare and heritage in exchange for personal interest and gain, it is tragically and ironically reminiscent of outlaw rule in portions our early west. Thank you for joining me. As a former owner of miniature horses I enjoyed your article on the Kamma Mountains mustangs. Your landscape photography is masterful. Thank you for leaving me a note, and for appreciating my piece on the Kamma mustangs. It must be so exciting to see real mustangs. These are nice. Exciting and humbling, Bente, they are so beautiful. You would love them. Check out the blog “Wild In The Pryors” to learn about the wild mustangs. Amazing information. You’ve got a beautiful soul. Love your writing and your photographs. Love your focus. You’ve got depth, purpose and style. Thank you for sharing your world with us. I’m delighted to have met you. The things that you’re describing are the identical qualities which draw me to your photographs and your writings. Thank you for visiting and for leaving me such a kind and generous note. My family really enjoys reading your blog; my son is writing an essay on wild horses in NV and he would like to include a couple of your pictures with his essay. 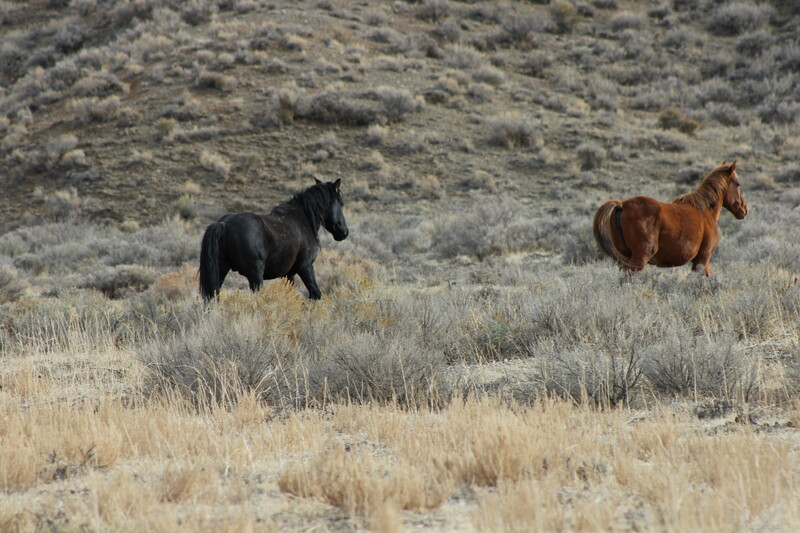 It was nice to find a Blog with good information on the Nevada Wild Mustang. Thank you for your very nice note and for your interest in Nevada’s wild horses. Your son is welcome to use a couple of the photos for his essay. Would you like to download them or shall I email the original files to you? Please provide credit to “Where God Takes Me.” If your son is inclined to share his essay upon completion, I would be delighted to read it. Thank you, for letting my son use a couple of photos from your Blog. He was very excited to include them. After I received your reply, I downloaded a couple, credit you, and printed them for him. He is in 4th grade and this is the first essay he has been excited about. I’ll email you a pdf of his essay when he is done. Thank you for updating me updated, Terry. How perfectly lovely that your son is excited about the topic of mustangs. I’m happy to help and look forward to reading his essay.